Park is surrounded by rural scenery. Activity Near Karangasem - Bali, Elephant Village located in Candidasa, near from Goa Lawah temple. 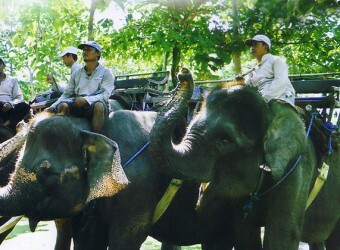 Surrounded by the river and countryside , you can enjoy walking arround by riding Sumatran elephant. Recommended for those take eastern Bali tourism and Telagawaja rafting package. The shortest course by sitting on teak seat takes 15 minutes. The 30 minutes course to go into the small forest and by the river. You might be able to meet wild monkeys. Memorial Photo (1photo/Rp.100,000), You can take photos with your camera as well. ※Please contact us for transportation information for Tanah Lot area. Additional fee is required. ※The time might be back and forth. ※It is not accepted to drop you off at any places except hotel. How many elephants do they have? What other animals live there? Is it free to take a photo with elephants? It is free to take photos with your camera. Memorial Photo by the agency is available Rp.100,000 / photo. Can a one person join the tour? A single guest can join the activity depending on the booking condition. In that case, transportation service is not included, so we recommend using car charter. There an elephant village in East Bali! I`ve ever experienced elephant ride in Bali Zoo Park, but it was the first time for me to enjoy elephant ride in the elephant village. I took a long ride of 60 minutes! It was so fun! Sumatran elephant is very well. It was the first time for me to have holiday with family in Bali and the children were the happiest. My children were very happy to enjoy elephant ride. I also loved to see my children smile.